I think Front Porch Forum is winning. They’ve managed to get 90% of households in a #VT neighborhood to sign up for it, and the community contributions are high quality, useful and interesting. Beyond that, there are a bunch of great neighborhood blogs in various pockets in the U.S., like West Seattle Blog and Uptown Update here in Chicago. And finally, I’m biased, but I think EveryBlock is genuinely interesting and useful, especially with our recent community-focused relaunch. Thanks Adrian! That’s great company for FPF to keep. (See StreetFight for the full interview.) As I’ve said before, EveryBlock’s relaunch is a powerhouse. Good news from Burlington’s Old North End today! Welcome home Albert the Wanderer. What are you, underneath it all? A lovely sentiment from a Front Porch Forum member in Middlesex, Vermont. Several sponsors have stepped forward to bring Front Porch Forum to their Vermont communities. These include a local chamber of commerce, a town, a college, a telecom, a family foundation, and a consortium of agencies and nonprofits. WCAX asked me today if FPF was open to further expansion in Vermont, beyond our current 60 towns. Short answer… yes! If you’d like to see FPF come to your town, join our waitlist. Additionally, if you’d like to help make it happen, contact us with ideas about funding sources and local boosters. Arthur Goyette knows the value of good neighbors. While his wife Betty was battling cancer, they brought countless meals to the Goyette home. When the neighbors learned that Betty had always wanted to ride in a convertible, they surprised the family with a loaned Chrysler Sebring. The couple drove down the block with the top down, surrounded by people waving and taking pictures. Arthur marvels that he might never have met these people f it weren’t for the Front Porch Forum, an online network of neighbors. The forum is a great example of how digital media and technology are changing how we connect to information and each other. The way we engage in public dialogue, coordinate, solve problems—all of it is shifting. Networks themselves are as old as humanity, used by activists from Mahatma Ghandi to the Tea Party to impact society. Today, though, technology is enabling networks to emerge in new ways. 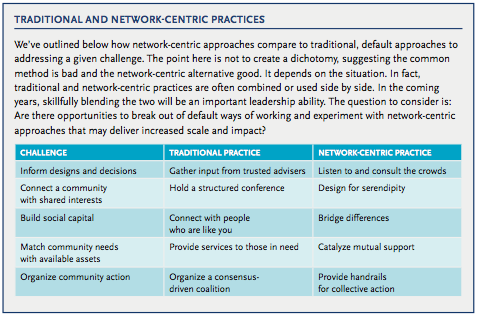 So Knight Foundation and Monitor Institute set out to look at the impact on communities, and ask, what do these emerging networks mean for community change? And, how can funders leverage them for good? 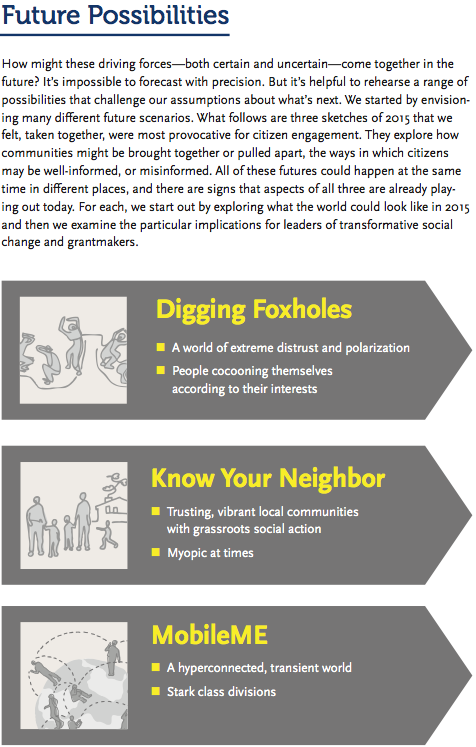 The result is our new report, Connected Citizens: The Power, Peril and Potential of Networks. Through more than 70 examples, we found networked communities pushing for open government, banding together to care for the elderly, enlisting volunteer coders to make online aid maps for earthquake ravaged Haiti, and more. A great response to a compelling ask. Justin was able to reach about 40% of his neighbors in this small Vermont town via FPF. Congratulations Justin on a fantastic start. People do wonderful things for their community when the tools are within easy reach. A special thanks to e-Vermont for bringing FPF to Bristol! Other Vermont towns interested in launching Front Porch Forum should contact us.